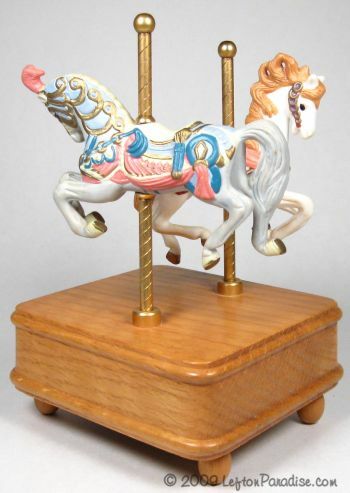 Carousel Horse Figurines on a Music Box -7904 Discounts Apply ! Two carousel horses displayed on a wooden music box base. The horses go up and down as the music box plays the "Carousel Waltz" from the musical "Carousel". In flawless condition, it stands 6½ inches tall and is dated 1990 and marked 7904. It has a Lefotn crown sticker and a Lefton trademark sticker.